Just like the buses, you wait ages for one to come along and then two come along at once. 25th May 2017 will go down as a historic milestone for squash, and it is a significant moment for the worldwide LGBTI squash community. It is the day that Jenny Duncalf and Rachael Grinham, both long term PSA World Tour members in the Top 30, publicly came out as lesbians. Prior to this there was not one out LGBTI professional squash player in the world. Not a single one had ever publicly revealed they enjoy a relationship with someone of the same gender. 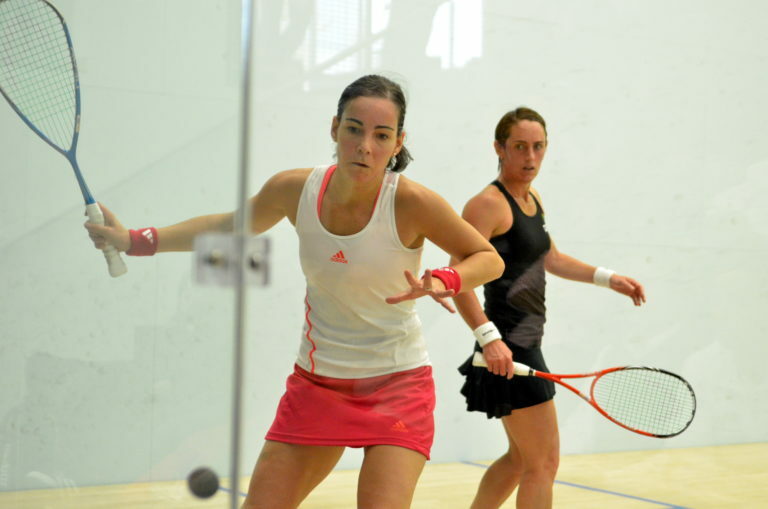 They aren’t your average current Top 30 players either, Jenny is a former world number 2 and Rachael a world number 1. I have played squash for 28 years. It’s my sport. I love it. I play, I coach, I referee, I encourage others to play my sport. I didn’t have a role model for me as a gay man in squash. Today I do, as does every other LGBTI squash player in the world. With this in mind in January 2017, a lesbian friend and I entered the Scottish Doubles Championships as probably the first out LGBTI doubles squash competitors in the world. We had fun, we won games, we didn’t win the competition but we played and people knew that we were gay. I was very proud to play with my friend Elaine Inglis. Elaine is an excellent squash player and came to close to representing Scotland as a junior. Unfortunately she has had some injuries over the last few years but on 6th May she made her debut for Scotland in the Over 35s team against Ireland, Wales and England. In the Scottish Doubles some of our competition included a former world number 4 in Paul Johnson and his sister Keeley, and a young whippersnapper from Dumfries who was playing with an experienced Scotland Masters team player. There’s a short video clip here (do they still say video these days?) of one of our games at the tournament. Scottish Squash & Racketball have engaged with me in the past and created an LGBT section on their website 5 years ago. They led the way as one of the first sports governing bodies with an inclusive transgender policy. Recently they set up an Equality Advisory Group to provide input to their strategy and asked me to be the chair. That experienced Scotland team player from the doubles, Sue Strachan is keen to increase the number of female players in Scotland, Hakim Din is engaging with the BME community and we hope to add a member of Scotland’s Deaf Squash team to our group. We had our first meeting in April and agreed with the Chief Executive and the National Lead for Sports Development to sign the LGBTI Charter in Sport as soon as possible. On 8th June at the official signing, words will have turned into actions. We have much greater plans than signing a piece of paper and I am proud that my sport’s governing body is showing support to my community. As the 2009 and 2013 World OutGames gold medallist, I have yearned for a professional player to come out and inspire all the LGBTI squash players across the world. Jenny Duncalf and Rachael Grinham are amazing squash players and I am so proud of them. They have inspired me as players and inspire me all the more as confident, out and proud lesbian women who play my sport. In the meantime I won’t be able to defend my title at the 2017 OutGames in Miami but I am organising the first Scottish LGBTI Open Squash Championships on 10th June at my club, Colinton Castle Sports Club. Scottish Squash are involved, my club is supporting us with a reduced court fee and I obtained funding from LEAP Sports Scotland to make this tournament in Festival Fortnight the most accessible on the European LGBTI squash calendar. Come and play. There might be one or two primadonnas but that won’t be anything to do with the squash. We’re all there for the community event. I’m not expecting any LGBTI pro’s but don’t let it stop you if they enter. So whether you know what you’re doing or if you’ve never picked up a racquet before, there’s a category for you – if you fancy coming along, you can sign up here. Written by Jonathan MacBride-Young on 26th May 2017. Jonathan is a squash player and founder of Colinton Squashers, still Scotland's only LGBTI squash initiative. From Northern Ireland, Jonathan now resides in Edinburgh and is a 2 times gold medallist of the World OutGames. Jonathan is also a former Board member of LEAP Sports and is an active member of the LEAP Sports East forum.